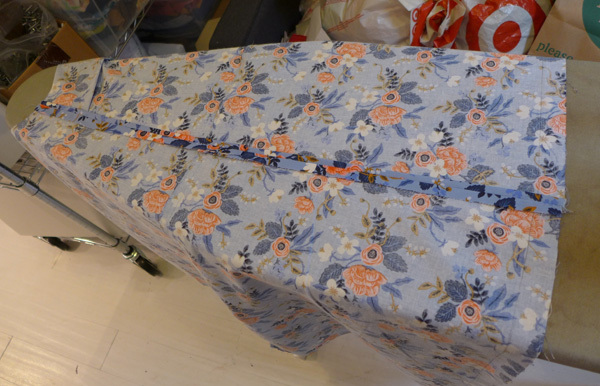 During my corporate life, I took a pencil skirt class at Vogue Fabric and of course gathered materials to build on that, except that my inherited sewing machine thwarted me and I gave up. 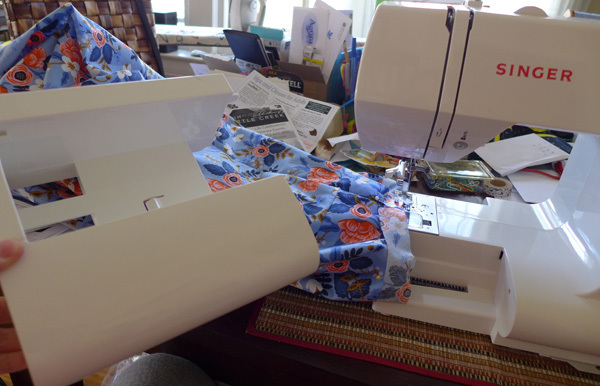 Â Eventually I gotÂ a brand-new machine, but I only used it for small projects and never went back to my UFOs, especially since my size changed over time and the pattern might not apply anymore. 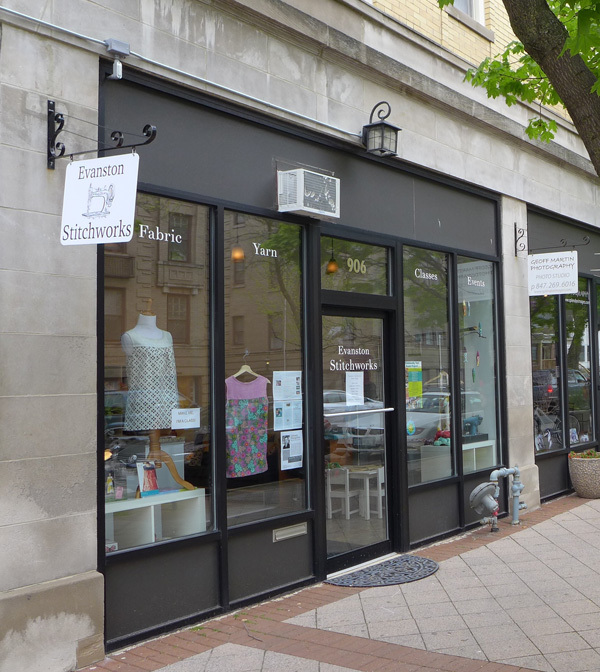 Enter Evanston Stitchworks, a lovely store along Evanston’sÂ Main-Dempster Mile offering sewing and knitting classes for teens and adults, along with all the supplies for those projects. 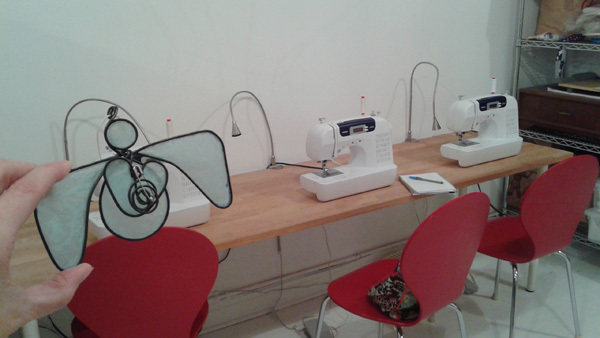 This “Stitch Lounge and Studio” has been in business for a few years, but moved to the Sherman Street location last year. 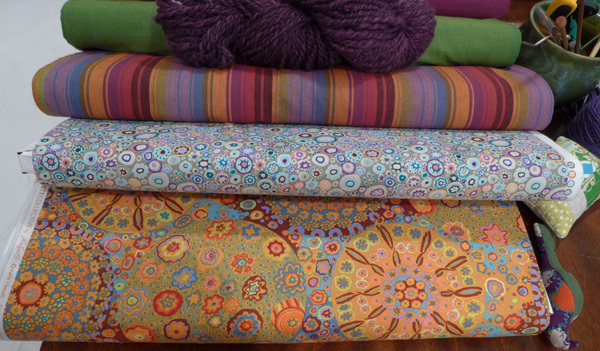 Owner Amalia curates beautiful high-quality and fabrics, findings, yarns and patterns. 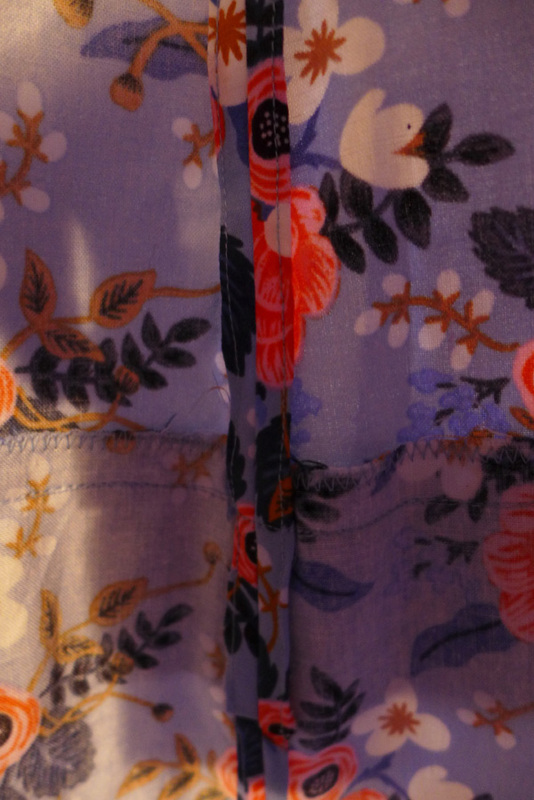 I love the vibe of the shop and the beautiful array of fabrics. Her store reminds me of the doll-shop my mom made for me as a child. 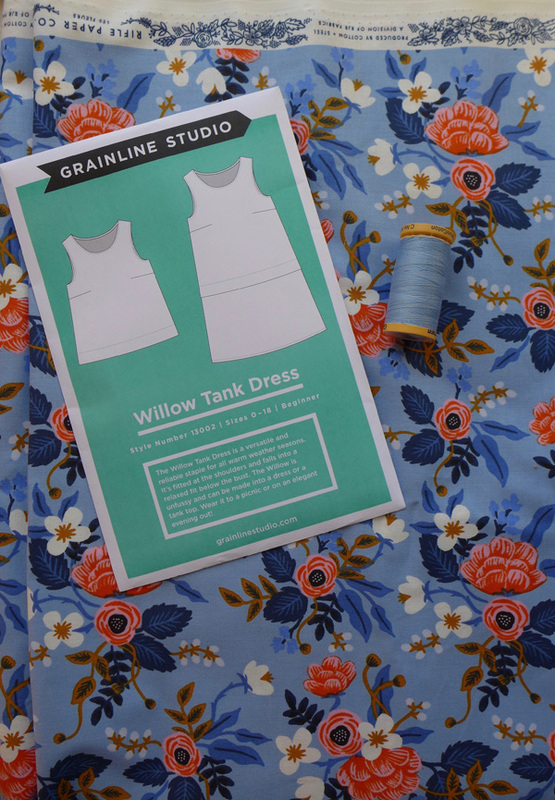 Intrigued by Amalia’s workshops since the beginning, my schedule finally worked out to where I could take the Willow Tank Top Dress class she hosted in February. 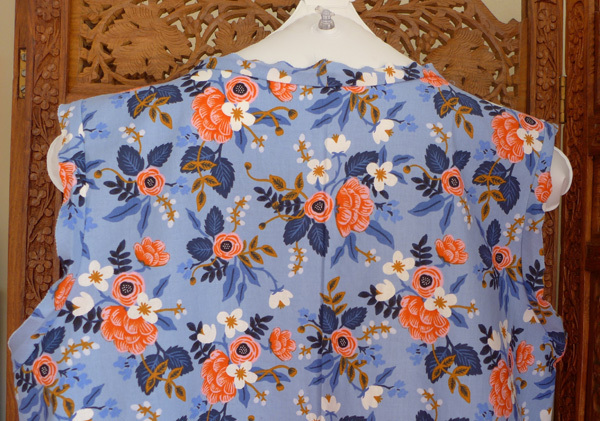 For three Wednesday evenings, four of us gathered at Evanston Stitchworks to learn to make this lovely pattern by Grainline Studio.Â It was hard to decide on a fabric, but with Amalia’s guidance I settled on a lovely Birch Floral Periwinkle print by Rifle Paper Company. 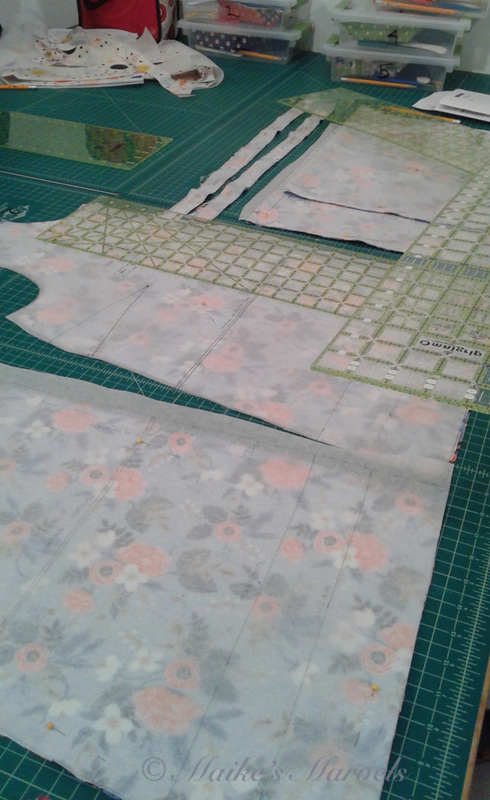 On the first evening, we traced our pattern onto an interfacing fabric, and spent the remaining time cutting out our pieces. Tracing our pattern keeps the original pattern paper intact, allowing for size changes, which I love. 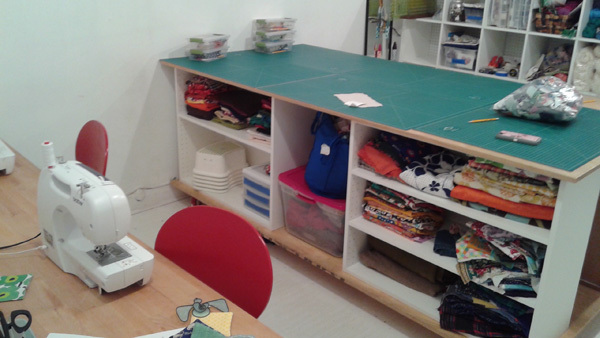 The next week, we started sewing half of the pattern together. One selling point of this pattern is that I learned to make darts, which are a useful skill for my anatomy. 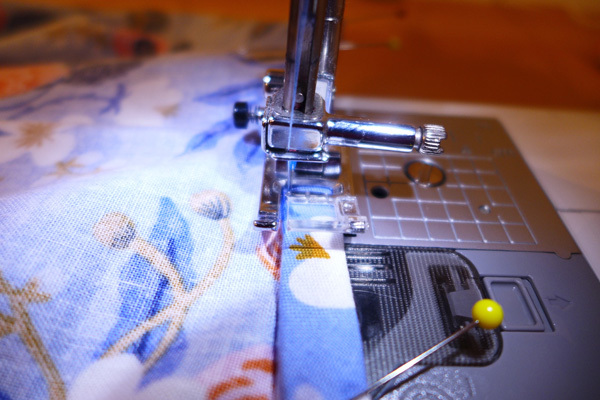 We learned machine threading, bobbin winding, and how to adjust needle and stitch settings during this session. 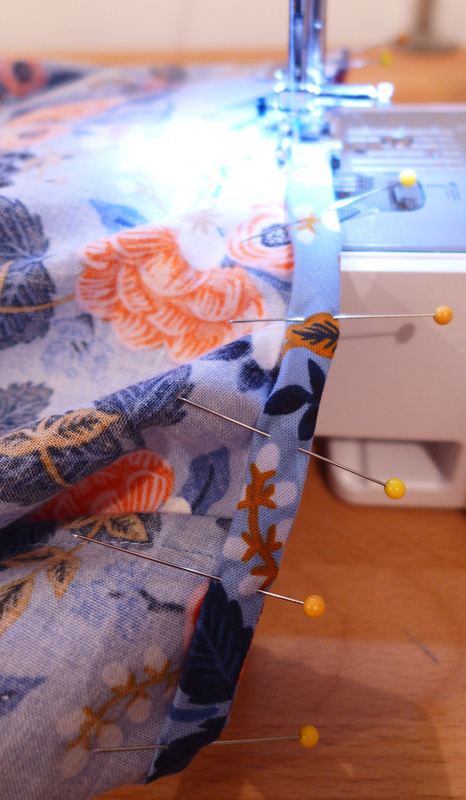 Lots of pinning was involved. My classmates did just the top, so my dress portion took a bit of adjusting by Amalia.Â We decided I would come in for an extra session the next day to get me caught up with the rest of class. 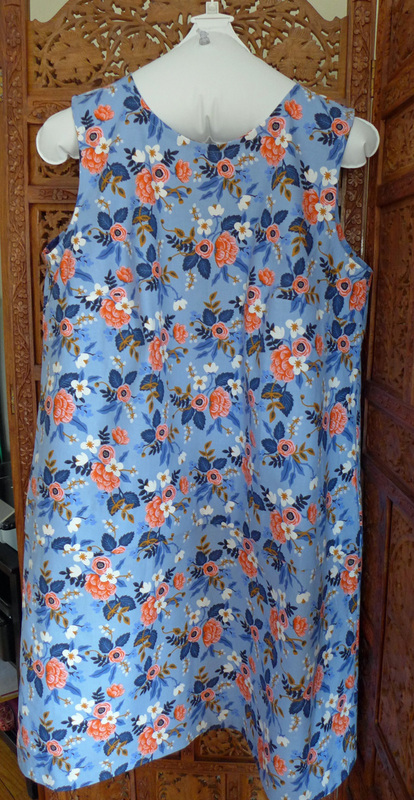 I sewed the fold, fixed a wrongly attached collar, and received confidence boosters on my sewing capabilities. 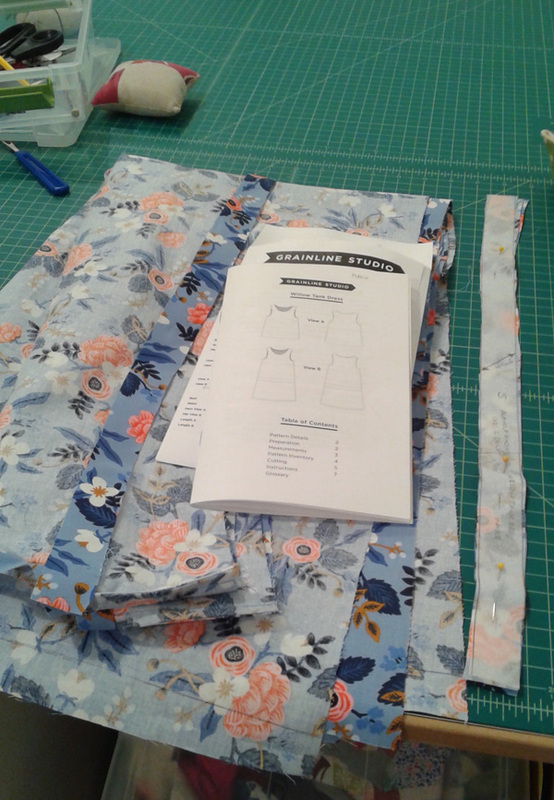 Sewing class also involves tutorials on pressing seams. 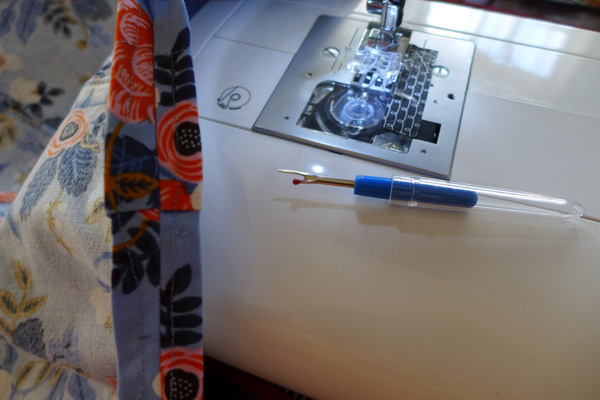 Then decided to go home to figure out my own machine for the other half of the dress. 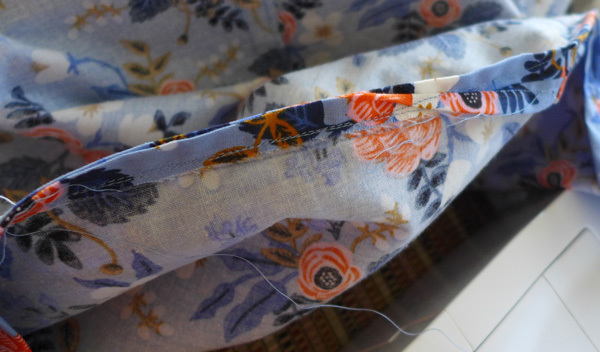 A few days later, I sat down with my manual to check out the difference between the Stitchworks machine and my own machine settings. Photo references helped me make sure I was doing the right thing with the arm holes. Getting theÂ attachment removed for the arm holes took some googling, but I got it figured out and was on my way. Seam rippers are lovely tools. 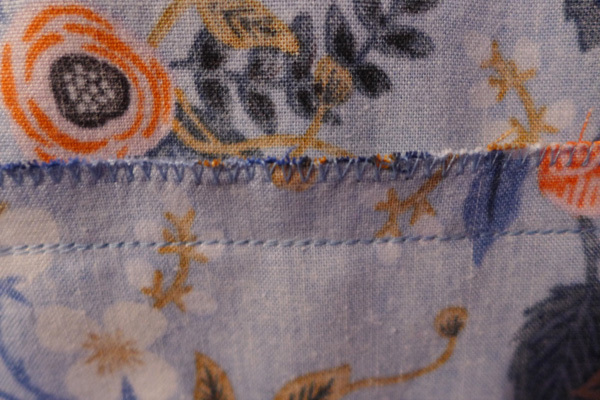 With all side seams connected and the hems all pressed, I was all caught up. 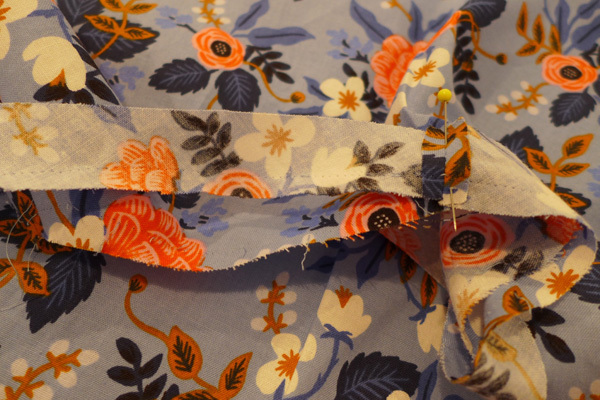 The final class was spent sewing the collar, arm holes and hem up to complete the dress. 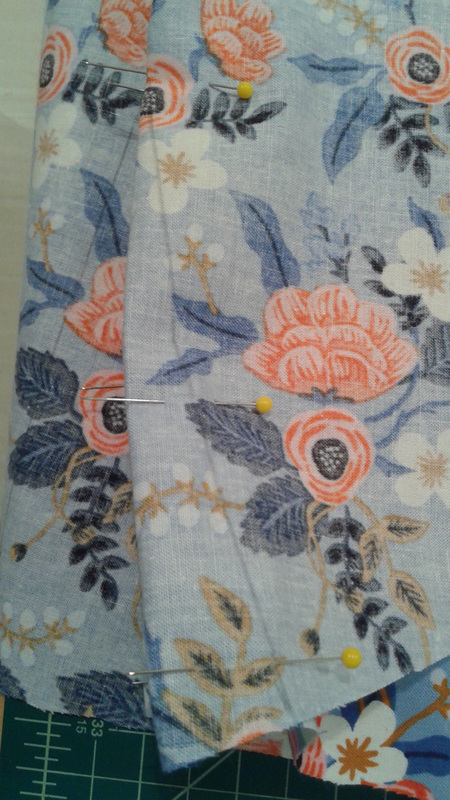 A side exercise was avoiding pinpricks during this round-aboutÂ fabric feed. 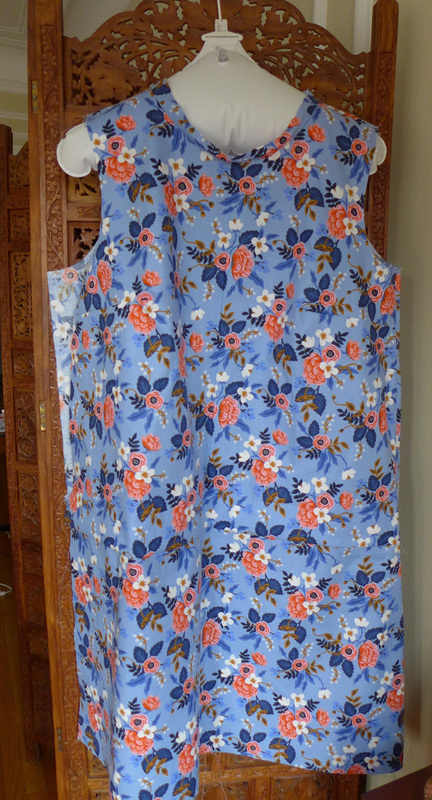 I got some ironing tips for the darts, photos of our end result were taken, and we all went home happy with our creations. 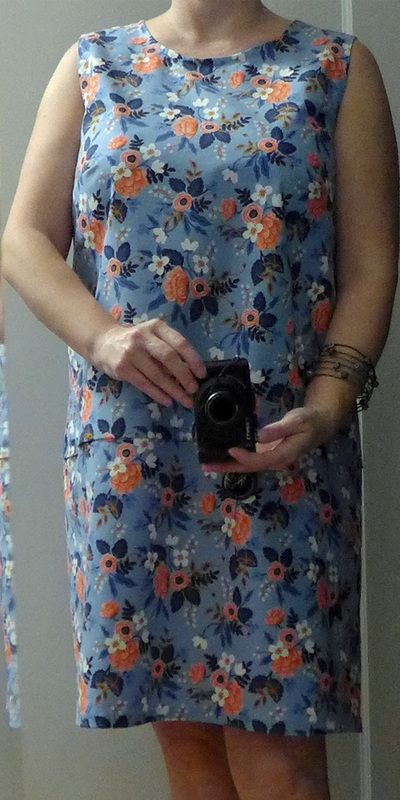 I cannot wait for the weather to warm up so I can wear this fun dress out! Overall, it took about 9 hours to put it together. Having Amalia supervise every move was affirming and confidence building. Knowing that my home machine is compatible also helps support future projects. 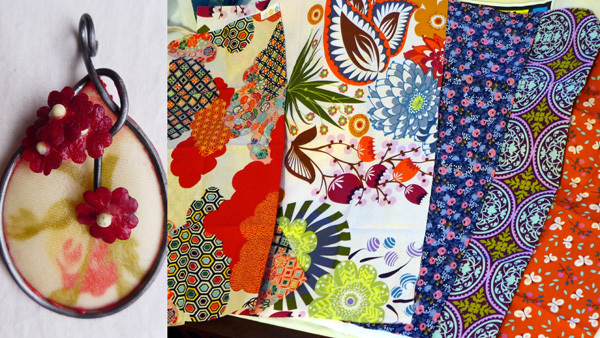 Now I need to incorporate the sample fat quarter fabrics I picked up on Small Business Saturday into my wax and wire creations. I already gave an old pendant a makeover with a dress remnant. 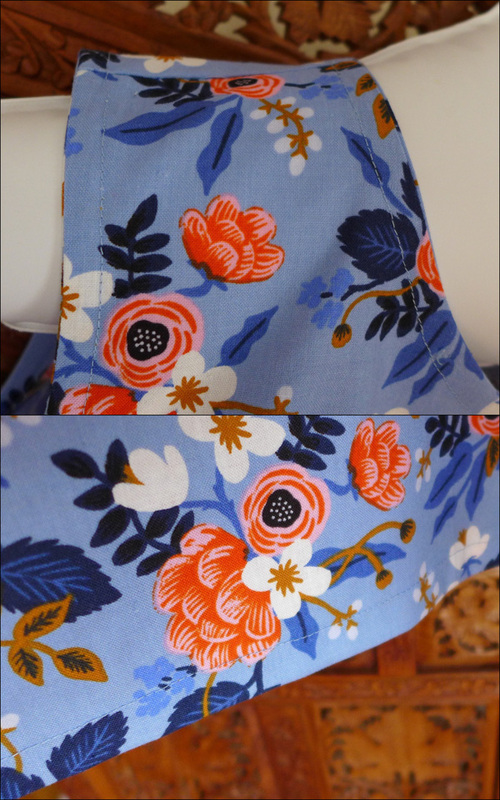 My next quest is deciding on the next fabric to make the dress again. 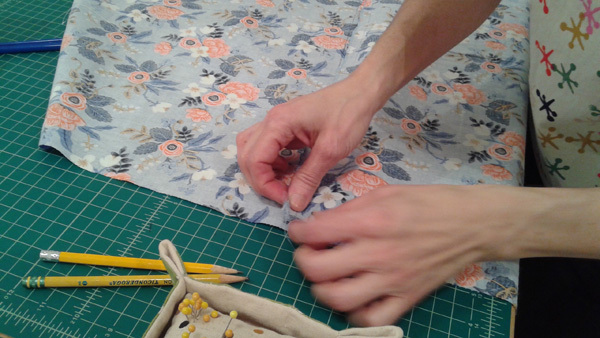 Evanston Stitchworks is located atÂ 906 Sherman Avenue in Evanston, Illinois and hosts monthlyÂ drop-in events that are posted on Facebook.Â Check out upcoming classes and online shopping opportunities here. You can also cheer up your Instagram feed by following Evanston Stitchworks. This entry was posted in Art & Culture, Musings and Inspiration and tagged Cotton Fabric, Dress Workshop, Dressmaking, Evanston IL, Evanston Stitchworks, Fabric, Fabric Shop, Grainline Studio, Main-Dempster Mile, Rifle Paper Co., Sewing, Sewing class, Sewing Workshop, Willow tank Dress, Yarn Shop. 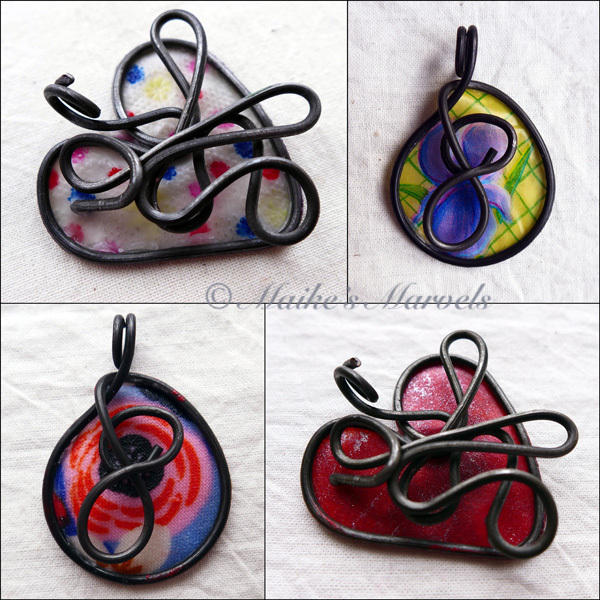 Maike provides expressions of love, joy and thanquility through wax and wire jewelry and encaustic art collages.